The Merchants Bank was the creation of shipping magnate Sir Hugh Allan (who was at the core of the CPR Scandal that brought down Sir John A. Macdonald's government). Other members of the Allan family held prominent positions in the bank after Sir Hugh died. Many of its notes, including this $5, show a steamship. The bank merged with the Bank of Montreal in 1923, having been badly shaken by serious losses. The river pilot seen at the left on the $5 was an Indian, named Baptiste, renowned enough to have been photographed by Notman of Montreal. The photo was the source of the vignette. 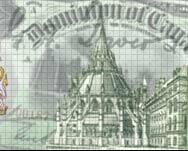 The Merchants Bank of Canada notes characteristically have heavy green tints covering all, or at least most, of the face. These two notes are not rare, but quite hard to get in grades above Fine. They are certainly quite attractive.